Boyds, Md. 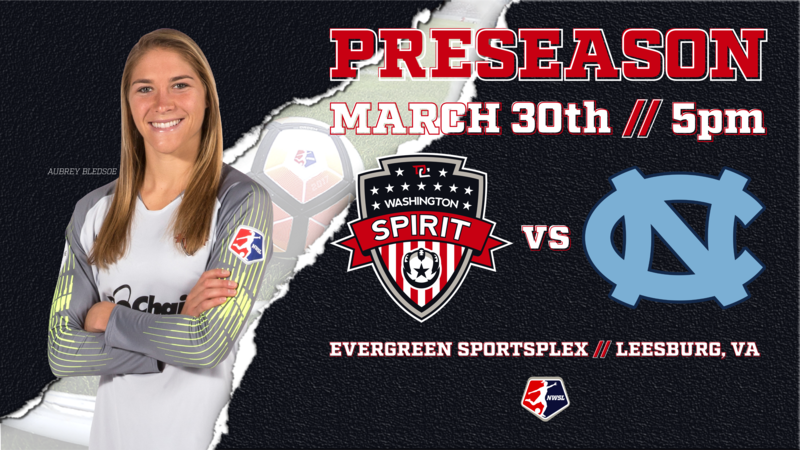 (3/29/19) – The Washington Spirit will be facing the University of North Carolina on Saturday in the club’s third preseason match of the year before the start of the 2019 NWSL season. The game will be hosted by the Evergreen SportsPlex in Leesburg, Va., with kickoff scheduled for 5 p.m. EST. Gates will open at 4 p.m. EST. Saturday will be the third year in a row that the Spirit have hosted the Tar Heels for a preseason friendly at Evergreen SportsPlex. Washington defeated North Carolina 5-0 in 2017 and played the 22-time women’s college soccer national champions to a 1-1 draw in 2018. Both games were played in front of sell-out crowds of over 2,000 fans. The UNC Tar Heels finished their 2018 campaign with a strong 21-4-2 record, reaching the ACC Championship but falling to Florida State University. UNC continued onto the NCAA Championship tournament, where they earned wins against Virginia Tech, UCLA and Georgetown before again falling to FSU in the NCAA Championship game 1-0. Washington Spirit midfielder Dorian Bailey was one of three players selected in the NWSL draft from that 2018 championship runner-up Tar Heel team. Spirit defender Paige Nielsen is also a former Tar Heel, winning the National Championship during her freshman campaign, and captaining the squad during her senior year before graduating in 2015. The Spirit kicked off their preseason camp in early March, with their first preseason game against James Madison University in Richmond, Va., a 5-0 Spirit win. In their most recent preseason game, the Spirit took an early lead against French side Girondins de Bordeaux, going up 1-0 at the half. The Spirit could not withstand a second-half surge from the Division 1 Feminine side, falling 3-1 at full time. Saturday’s match will not be live streamed. Live updates will be provided via the Spirit’s Twitter feed @WashSpirit and Facebook page. The Spirit will play their final preseason game against Virginia Tech University on April 6 at the Maryland SoccerPlex before beginning their regular season campaign with their home opener against Sky Blue FC on April 13 at the Maryland SoccerPlex.